SWOT will provide the very first comprehensive view of Earth's freshwater bodies from space and will allow scientists to determine changing volumes of fresh water across the globe at an unprecedented resolution. Hydrologists will use the data to calculate the rate of water gained or lost in lakes, reservoirs, and wetlands as well as discharge variations in rivers, globally. These measurements are key to understanding surface water availability and in preparing for important water-related hazards such as floods and droughts. 'Satellites reveal a new view of Earth's water from space' by SWOT Hydrology Lead, Tamlin Pavelsky. 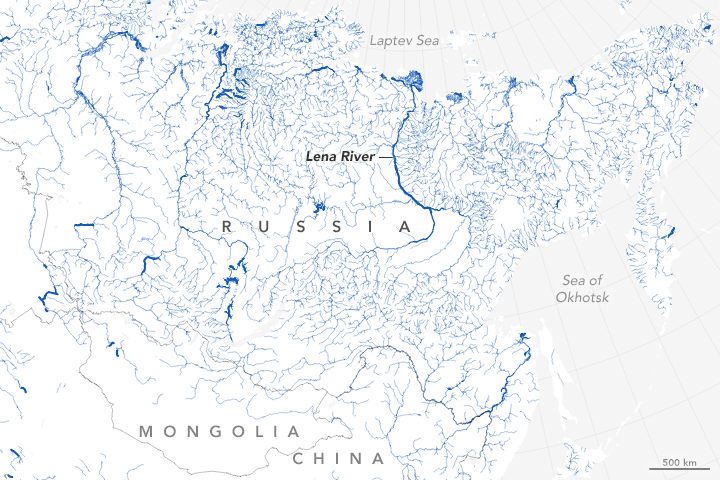 Provide a global inventory of all terrestrial water bodies (lakes, reservoirs, wetlands) whose surface area exceeds 250 m by 250 m (~820 ft by ~820 ft) and rivers whose widths exceed 100 m (~330 ft). At sub-monthly, seasonal, and annual time scales: Measure the global storage change in freshwater bodies; and Estimate the global change in river discharge. Given our basic need for fresh water, hydrologic observations of time-related (temporal) and geography-related (spatial) variations in water volume stored in rivers, lakes, and wetlands are extremely important. By measuring water storage changes in wetlands, lakes, and reservoirs - making it possible to estimate discharge in rivers more accurately - SWOT will contribute to a fundamental understanding of the terrestrial branch of the global water cycle. 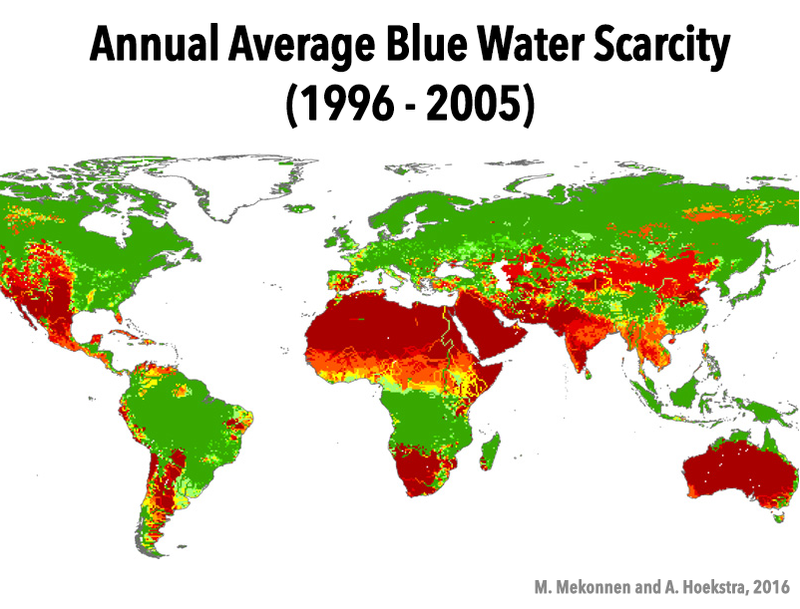 In the article, Four billion people facing severe water scarcity, the authors state, "at the global level and on an annual basis, enough freshwater is available to meet (society's) demand, but spatial and temporal variations of water demand and availability are large, leading to water scarcity in several parts of the world during specific times of the year." By providing essential information on Earth's medium-to-large, land-based water bodies on average twice every 21 days, SWOT will reveal new details on the changing patterns of freshwater availability that affect large populations. 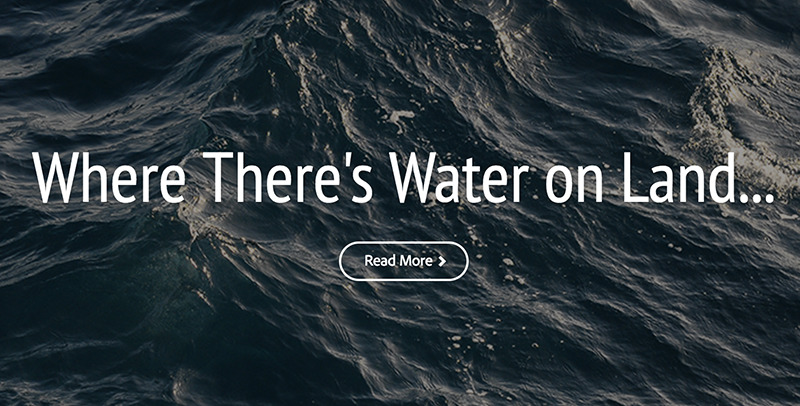 On land, most water accessible to humans is stored in lakes, rivers, and soil and groundwater. Water enters these reservoirs through precipitation (rain, snow) and flow from their surrounding watersheds. Water leaves via evaporation, transpiration (evaporation through plant leaves) and river discharge into the ocean. 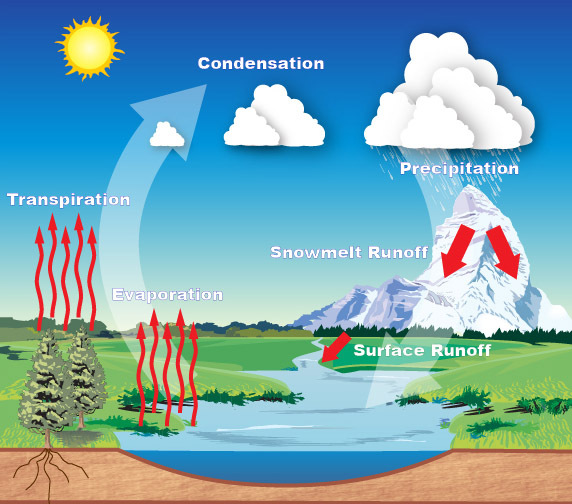 A simplified view of the water cycle shows a balance between water entering the land surface by precipitation and water leaving the land surface by evaporation, transpiration, and runoff. This type of "balance equation" serves as the basis for computer algorithms used to model hydrological conditions. The most sophisticated computer models include data assimilation, a process that continually compares previous forecasts with newly received measurements (e.g., actual rainfall data) to update and improve the model itself. A challenge for SWOT is developing robust global hydrological models and assessing how assimilation of SWOT data will improve representation of the water cycle. A new database of rivers and their widths will be used to interpret data from SWOT, which will measure changes in river and lake heights globally. For example, the current understanding of Earth's water balance on land is poor. This is partly because of a lack of global runoff data needed for accurate computer models. Today's models can simulate very different patterns of runoff, as shown by the two example computer model outputs below. For the areas circled in white, the difference in these models is equivalent to the average rainfall in Los Angeles over an entire year. A key target for SWOT is providing runoff data at sufficiently fine spatial scales to improve the knowledge of water balance on land. The over-arching goal of the project is to develop a set of algorithms and modeling systems to be used by the SWOT mission for the retrieval of river discharge estimates globally. Our project aims to develop a modeling and data assimilation framework that can be implemented efficiently for generating a SWOT Level 4 data products consisting of continuous fields of water surface elevation, discharge, and storage change globally. This project aims to develop novel approaches for integrating lateral inflows and lake/reservoir outflows into an established SWOT discharge algorithm to reduce SWOT discharge errors. This project seeks to contribute to lake mapping and lake product generation in the SWOT mission. We in Year 1 concentrated on modeling SWOT topographic layover distributions based on KaRIn's sensing geometry, and analyzing global lake observability from SWOT using our recently produced global high-resolution lake database, SWOT orbits, and terrain layover simulation. The major research objectives in Year 2 include (1) to finalize global lake observability results and study global reservoir observability; (2) to model uncertainty in SWOT lake mapping; (3) to investigate lake compositing methods in cycle-based lake product generation. Variational data assimilation has been applied for discharge estimation under uncertainties in river bathymetry and bed roughness using the hydraulic model SIC2. Synthetic WSE measurements, which emulate the spatial and temporal sampling of the SWOT mission, are assimilated for the Garonne River downstream reach. Similar tests have been carried out on the Po and Sacramento Rivers using the SWOT hydrology simulator developed at JPL. We investigate simultaneous estimation of discharge, river bathymetry and bed roughness in the framework of the extended control vector approach. With rising population growth and increasing demand for resources, surface water is being redistributed and artificially managed to the extent that there are few pristine river basins left today in populated regions without the strong human footprint caused by water diversions, barrages, dams and irrigation projects. The current reality is that in these populated regions of the world, it has become intractable to have accurate knowledge of the management component of water for physically predicting the surface water component of the human-impacted water cycle. The specific objective of this proposal is to use Rainfall estimation from satellite (GPM constellation / Megha-Tropiques mission) to better understand and predict the river discharge variability as it will be observed by SWOT. A summary of participation of the United States Geological Survey (USGS) in SWOT activities, and an outline of plans for FY 2017. In 2017, plans include participating in the Sagavanirktok River field effort, contributing to the Discharge Algorithm Working Group, and conducting measurements from unmanned aircraft to assist with calibration and validation of SWOT-like measurements. The main objective of this study is to develop methodologies for using SWOT data to improve the input parameters and the physics of the hydrological and hydrodynamic parameterizations in ESMs at the global scale, including rivers, lakes and ground water reservoirs, leading to improved estimates of the corresponding reservoirs and exchanges between them. The objective of this SWOT Science Team project is to aid pre-launch preparations and scientific development for the surface water hydrology component of the NASA/CNES/CSA Surface Water and Ocean Topography (SWOT) mission. The Surface Water and Ocean Topography (SWOT) mission will enable estimation of water level and velocity along the coast and within large rivers. However, SWOT's capabilities and limitations in coastal wetlands remains to be assessed. Coastal wetlands are complex systems characterized by a mosaic of various vegetation types covering the water surface and are interspersed with numerous rivers and channels of different sizes. Our overall goal is to assess the potential and limitations of SWOT to measure and monitor hydrodynamic processes in coastal wetlands, and to define the SWOT science products specific to coastal wetlands. The group is composed of CECI (CERFACS/CNRS, Toulouse, France) and LNHE (EDF R&D, Chatou, France). It gathers expertise in hydraulic modeling (TELEMAC-MASCARET software) and applied mathematics with a focus on uncertainty quantification (UQ) (sampling, analysis of variance, surrogate models) and data assimilation (DA) (ensemble-based methods, filtering algorithms, variational methods). The group has been working together for several years; the most significant developments stand in the implementation of Kalman Filter derived algorithm for model state and parameters correction via DA of inset observations and its operational use for flood forecasting and water resource management. A perspective for these studies, developed here, is to use Surface Water and Ocean Topography (SWOT) data to improve hydraulic model parameters and results and consequently improve water level and discharge simulation and forecast.